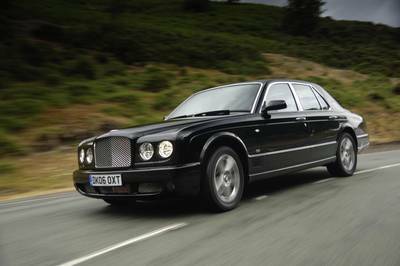 Bentley Motors continues the intensive development of its flagship Arnage range with the introduction of a major programme of powertrain and chassis enhancements for the 2007 model year. The Arnage's renowned 6.75-litre V8 engine now develops up to 500 bhp and is mated to a six-speed automatic transmission benefiting performance, driving dynamics and refinement. The powertrain changes are complemented by subtle exterior, interior and under-bonnet design cues. Key to this performance increase is the most powerful version of Bentley's legendary V8 engine ever built at the company's headquarters in Crewe, England. In the performance-oriented Arnage T model, the revised twin-turbocharged V8 engine produces a staggering 500 bhp and 1000 Nm of torque - an 11 percent increase in power and a 14 percent increase in torque over the outgoing model. Twinned with the latest six-speed ZF automatic transmission, which uses state-of-the-art computer management, performance and refinement are optimised at all speeds. In the Arnage R and RL models the new engine is boosted from 400 to 450 bhp, while torque climbs from 835 to 875 Nm. "The 2007 Model Year Arnage range is clear evidence of our intent to ensure Bentley's flagship model remains at the forefront of technology and delivers the performance, refinement and luxury that every Bentley customer demands," explains Stuart McCullough, Member of the Board, Sales and Marketing. The 500 bhp Arnage T is a true driver's car with much higher performance and delivers an even more rewarding driving experience. 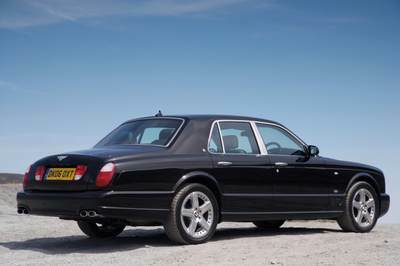 The improvements to the refinement and comfort of the 450 bhp Arnage R are equally striking, while the long-wheelbase RL shares the same increased power output together with major improvements to the rear passenger cabin. "Two years ago we introduced major upgrades to the Arnage's chassis, steering and brakes," says Dr Ulrich Eichhorn, Member of the Board, Engineering. "Those improvements meant the car could easily handle a significant increase in power and torque, so work began on this important powertrain programme." The 2007 Model Year Arnage also benefits from safety, interior and design improvements. Every Arnage now has a Tyre Pressure Monitoring System, rSAP Bluetooth integrated telephone system and improved driver ergonomics as standard. Additionally, new wheel, exterior paint colour and interior trim options are available, as well as an optional retractable 'Flying B' bonnet mascot. 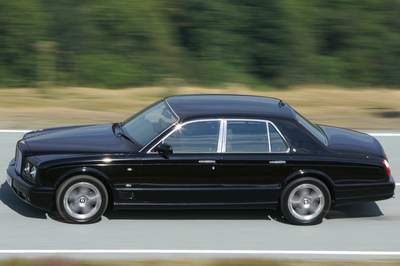 The new 2007 Model Year Bentley Arnage range is now in production. - Uprated 6.75-litre twin-turbocharged V8 engine in Arnage T produces 500 bhp and 1000 Nm torque, thanks to new low inertia turbochargers and roller tappet system. - Arnage R and RL models uprated to 450 bhp and 875 Nm of torque. - Latest six-speed ZF automatic transmission with sophisticated locking torque converter provides fast yet ultra-smooth gearshifts. - New Electronic Stability Programme (ESP) logic system improves dynamic response and handling with less intrusive intervention when a reduction in grip is detected. - New Tyre Pressure Monitoring System fitted as standard to all Arnage models. - Improved driver ergonomics thanks to 25 mm increase in length of steering column and in vertical steering wheel adjustment. - Exterior design styling changes includes new dark finish to Arnage T front radiator and bumper grilles, standardised bright chrome finish to R and RL grilles, and Bentley 'B' badges on the rear pillars. - Underbonnet styling now features a black crackle finish to the Arnage T's inlet manifold, embossed Bentley logo on plenum chambers and new '63/4 LITRE TWIN TURBO' engine plaques. - Interior design updates include new hide-trimmed gearlever and chrome gearlever bezel providing access to semi-automatic transmission function. - New Thin Film Technology driver information panel displays more comprehensive and clearly accessible information. - Arnage RL model receives additional standard specification including rear centre armrest bottle cooler, veneered rear centre cushion box, rear rSAP master telephone system, and reversing camera (US, EU, Australia and New Zealand markets only). Bentley's 6.75-litre V8 engine is the centrepiece of the 2007 model year Arnage development programme. This remarkable engine, the fundamental design of which has served Bentley models proudly for nearly five decades, has been extensively re-engineered to provide, in Arnage T specification, 500 bhp and 1000 Nm of torque - figures that ensure that the legendary Bentley wave of torque is even more astonishing than before. Top speed of the Arnage T has risen from 270 km/h to 288 km/h, while the 450 bhp Arnage R and RL's maximum speed increases by 21 km/h to 270 km/h. When the first V8 engine was built in the 1950s, the design brief unwittingly benefited later generations of Bentley engineers. It was a very forward thinking design with an all-aluminium construction, a five main-bearing crankshaft, and a well-supported camshaft. The steps taken then laid the foundations for the longevity of the engine. "People might raise an eyebrow when they are told that the V8 engine in their 2007 model year Arnage was first used by Bentley in 1959," says Bentley Motors' Director, Powertrain and Chassis, Brian Gush. "But the reality is the basic design was so good that we have been able to continually improve it for nearly 50 years. "One of the reasons the engine has evolved so successfully is the position of the exhaust valves, high in the cylinder head, originally designed for rapid heat dissipation to help engine cooling. Decades later it meant that we could heat the catalytic converter due to the short path from valves to catalysts, which benefits exhaust emissions. This is just one of the reasons why this brilliant engine lives on today." That first 6.25-litre engine produced around 200 horsepower - the new 2007 model year 6.75-litre V8 has more than twice that output, with 500 bhp and 1000 Nm of torque for the Arnage T. It was the introduction of turbocharging and intercooling in the early 1980s that saw step-change increases in the V8's performance, and the latest engine programme is no different. Two new low-inertia turbochargers operate with far greater efficiency at lower engine speeds - they reach maximum turbine speed in half the time of the previous unit - thereby ensuring significantly reduced turbo lag and that prodigious wave of torque at any revs. Furthermore, a reprofiled camshaft with an all-new roller tappet system provides revised valve timing and substantially improved refinement. These changes also deliver for increased power, enhanced durability and ensure compliance with European EU IV and US LEV II standards. Although the 2007 6.75-litre engine produces around 300 horsepower more than its 1959 predecessor, its fuel consumption is only 60 percent of the original and thanks to its advanced fuel injection and exhaust controls, its emissions output is an incredible 99 percent lower than Bentley's first V8. - The wider range of ratios is specifically tuned to each Arnage model, ensuring greater flexibility, response and refinement for every model. - Performance feel is also improved by using a sophisticated locking torque converter system which provides a more rapid response to throttle inputs. - Three transmission modes (Drive, Sport and Semi-Automatic) allow the driver to take full advantage of the new gearbox. Semi-Automatic mode is accessed by placing the gearlever into the sequential manual gear-selector gate, where a new ratio can be engaged simply by pushing the lever forwards or backwards. A sophisticated electronic management system plays a major role in providing fast yet smooth gearshifts regardless of how the car is being driven. Previously the Arnage's engine and transmission were governed by independent electronic systems; in the 2007 model year, an uprated Bosch computer-controlled management system ensures that both parts work as a single unit to produce a supremely refined yet highly responsive drivetrain. "The new ZF gearbox gives us a different dimension in transmission control," says Dr Ulrich Eichhorn, Member of the Board, Engineering. "Our main objective was to get the engine and transmission working together enabling us to transmit every ounce of power. Using the lock-up in all gears eliminates what we call the 'rubber-band' effect - the surge of engine speed without a corresponding acceleration of the car - and gives much more immediate connection of throttle input to road speed. "As the engine speed approaches the point at which a gearshift is due, it signals to the transmission that it is time to shift, so the ratio changes are much quicker - it feels significantly faster from the driver's seat. Similarly, when the gearbox is ready to change up it asks the engine to reduce the torque just for the period of the shift, which adds to the refinement." Another important development for the 2007 model year Arnage range is the separation of the sports suspension and sports gearbox settings, allowing the driver to select their preference for each system independently - via a 'Sport' button on the dashboard for the suspension and by positioning the gearlever for the transmission's Sport mode. A comprehensive chassis tuning programme was instigated alongside the powertrain updates to ensure the Arnage's chassis comfortably handles the additional performance. Refinements to the ESP logic system allow more spirited handling without any reduction in stability or safety. The Traction Control system is extensively recalibrated with the aim of avoiding unnecessary reduction in engine torque. The ESP system now monitors the car's overall stability rather than simply loss of grip to the wheels. This reduces the amount of intervention required and restores power earlier and more progressively, allowing the power of the engine to be fully exploited. "We don't believe in creating power and then taking it away," says Brian Gush, Director, Powertrain and Chassis. "This new system allows the driver a lot more freedom to feel where the traction limit is without ever getting into trouble. The traction control is much more progressive and proportional - you can drift the car with some wheelspin but it never lets you get in any trouble. It is a calibration which keeps the spirited driver in mind." Following the detailed design updates made to the 2005 model year Arnage, the latest models receive further exterior styling changes. "The revisions we made to the Arnage series two years ago gave the range exactly the sort of contemporary yet authentic Bentley feel that it needed," says Head of Exterior Design, Raul Pires. "Now with big increases in power and performance we wanted to add some subtle design cues to reflect the differences between the Arnage models." The performance intent of the Arnage T is underlined by the addition of a new dark finish to its front radiator and bumper grilles. A standardised bright chrome finish is applied to the R and RL grilles while Bentley 'B' badges have been applied to the rear pillars on all models. To highlight the superb feat of engineering beneath the Arnage's bonnet, a newly styled engine bay leaves no doubt as to the potency of the car. A black crackle finish has been applied to the Arnage T's inlet manifold, while every model displays an embossed Bentley logo on the turbocharger plenum chambers and new '63/4 LITRE TWIN TURBO' engine plaques. Additional optional extras include a 19-inch six-spoke disc wheel for the R and RL models, and 19-inch five-spoke 'Blade' sports wheel for the Arnage T. Also available across the range is the famous winged 'B' mascot, which saw a welcome return this year on the Diamond Series Arnage. The iconic mascot - which can retract neatly into the grille surround - was originally designed by motoring artist F. Gordon Crosby and first used on the 1930 Bentley 8 Litre. Interior design updates include a new hide-trimmed gearlever, chrome gearlever bezel, and new Thin Film Technology driver information panel to display more comprehensive and clearly accessible information. The Arnage RL model receives additional standard specification including a rear centre armrest bottle cooler, veneered rear centre cushion box, rear rSAP Bluetooth master telephone system and reversing camera (US, EU, Australia and New Zealand markets only). "These important powertrain enhancements reaffirm the very essence of the Bentley Arnage, offering our customers an absolutely unique blend of seamless power and torque which produces storming performance when you demand it and blissfully relaxed cruising when you don't."